You know that FOOT ARTHRITIS + WALKING = PAIN! 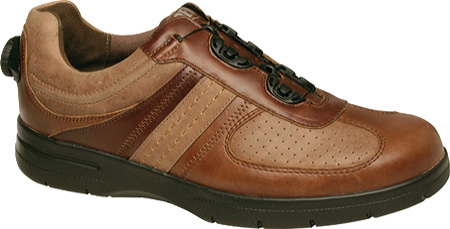 When you choose good arthritic shoes, they can go a long way to ease your pain! 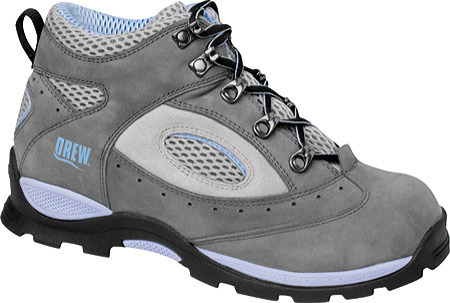 Yes, there actually are arthritic shoes specifically designed to help ease your arthritis foot pain when you walk. Learn more about what to look for on this page when you're ready to buy them. Visit our Arthritis Foot Pain and Walking page for more background information. It's important to take your time when you're shopping for good arthritis shoes. You need to be able to make the right decision so you can manage your pain when you walk! Proper shoe selection can make a huge difference. The stress of impact when your feet strike the ground. The pressure on your feet when you are standing or walking on them. You need to take defensive measures to minimize these two problem areas. First, you can control the impact stress when you walk by looking for excellent foot cushioning in the shoe. Look for shoes with a good cushioning sole & removable cushioning insoles. A high and wide toe box. Lots of space in the toe area. Removable insoles that give you more flexibility in adjusting the fit. The ability to insert orthotics when needed. Rigid rocker soles for easier lift-off as you walk and reduce the stress on the ball of the foot. Soft uppers that will stretch a bit to reduce pressure from swelling. 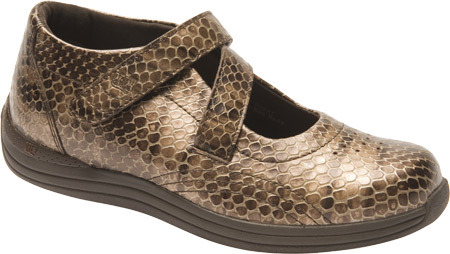 Uppers made of breathable material (leather is good) that can help prevent foot ulcers and infection. Have stretchable lace or velcro closures that can be loosened easily if your feet swell - especially if your fingers aren't quite as nimble as they used to be. Avoid high heels. Lower than 1" is best. Many of these features can also be found in regular shoes and they can sometimes work just fine for you. If you're not sure, you can always look for stores that specialize in arthritis shoes that should have these features. Bring this list with you to keep the salesman on her toes just to be sure! 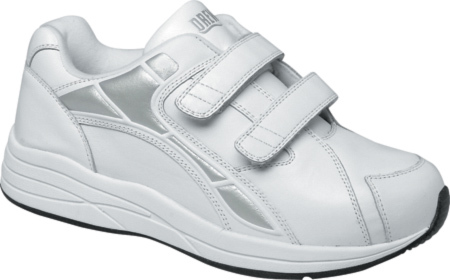 Drew Shoes is one of the oldest, most highly regarded maker of reputable arthritic and diabetes* shoes. They put over 135 years of experience in to each shoe. Their shoes consistently score very high marks with their customers. Free Shipping & Free Returns within the USA. In some cases you may need to consider having custom arthritic shoes made. You may not be able to find a proper fit for your feet. In this case you should consider seeing a doctor who specializes in arthritic feet issues or a pedorthist. A pedorthist is a board-certified professional who is trained in the proper assessment, design, manufacture, fit and modification of foot wear and foot appliances. These links may help you find someone in your area. You really do need to wear socks that are properly designed to provide additional foot padding to ease stress, shear and shock forces on your feet when you do suffer from arthritis foot pain. There's one company we know that does this better than anyone. They've been doing it for over 50 years. 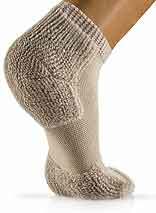 Should you suffer from arthritis foot or diabetes foot pain, Thorlo Socks has suggestions and possible solutions for you as well. First we recommend you go to this page and read the background information on these specialty socks. Click on the Learn More tab on these pages for complete info. Then before you decide to purchase take advantage of the Free Consultation below. You're welcome to consult directly with Susan Graham, their therapeutic sock specialist in all matters of foot health, foot care, proper sock selection and fit. Susan will take as long as it takes to ensure you're properly cared for - especially for diabetes and arthritis foot conditions. *800-438-0286, ext 7254, 8-5 EST Mon-Fri.
Be sure to let her know that Yoko & Geoff sent you. *NOTE: This is Susan's private, direct line for our visitors and not the public number on their website. We highly recommend them. You are also welcome to visit their non-profit website called Institute For Preventive Foot Health for much more info on foot care and foot health. Now you know what to look for in arthritic shoes and places to find them. You also have options to consider for custom shoes. As you have seen there is good news here. There are solutions for you in most cases. It's worth your time to look into them. Prolong your active walking and mobility for some time. OK! Got those great fitting and feeling arthritic shoes and socks? Let's get started with our Level 1 Fitness Walking Program. Very gentle, work into it slowly. See how it goes for you. Getting out for even a little fitness walking can do wonders for you. HINT:Type a word or phrase that describes your need into the SEARCH FIELD at each resource site below to get personal results that are just right for your situation.